Indian PM Mr Narendra Modi is in news – the conference at Fortaleza – the State capital of Ceara, in Northeastern Brazil. In 1980s the dream of youth was to write BSRB, get selected and work in a Bank…… lakhs wrote the competitive exams that one would find the entire building or at least the floor filled with the same names as centres were allotted to candidates on alphabetical basis. For a long time in the history of India, banks in India except the State Bank of India were owned and operated by private persons. By the 1960s, the Indian banking industry had become an important tool to facilitate the development of the Indian economy. At the same time, it had emerged as a large employer, Ms Indira Gandhi, the then Prime Minister of India, made the swift move of nationalization through an ordinance and from midnight of 19th July 1969 (some of you were not born) … 14 large commercial banks were nationalized. In 1980 another 6 were added. Now you have 21 Nationalised banks, SBI and associates (8); scores of Regional Rural banks, Private sector banks, branches of Foreign bank and more… this about a Bank – altogether different though !!!! In 1949, the prospect of further Communist expansion prompted the United States and 11 other Western nations to form the North Atlantic Treaty Organization (NATO). The Soviet Union and its affiliated Communist nations in Eastern Europe founded a rival alliance, the Warsaw Pact, in 1955. The alignment of nearly every European nation into one of the two opposing camps formalized the political division of the European continent ~ and India called itself ‘non-aligned’ during Nehru and post era. BRICS is the acronym for an association of five major emerging national economies: Brazil, Russia, India, China, and South Africa. 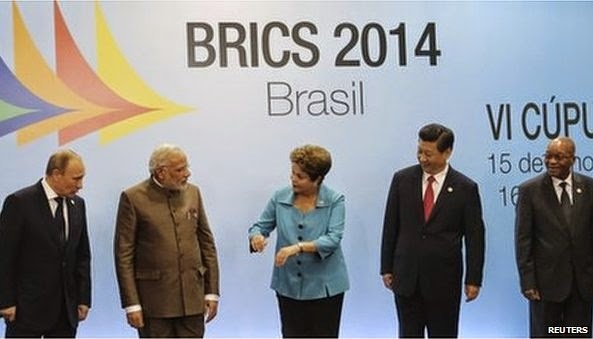 The grouping was originally known as "BRIC" before the inclusion of South Africa in 2010; all five are G-20 members. As of 2013, the five BRICS countries represent almost 3 billion people with a combined nominal GDP of US$16.039 trillion and an estimated US$4 trillion in combined foreign reserves. As of 2014, the BRICS nations represented 18 percent of the world economy. South Africa held the chair of the BRICS group in 2013, having hosted the group's fifth summit in 2013. The first BRIC summit was held in Yekaterinburg, Russia in 2009. BRICS summit is on at Fortaleza and countries will discuss the possible admission of Argentina as the sixth member country. Indian Prime Minister Narendra Modi. Besides the fab 5 – the guests are : Argentina, Chile, Colombia, Ecuador, Guyana, Paraguay, Peru, Suriname … Argentina, Egypt, Iran, Nigeria and Syria have also shown keen interest in joining BRICS in the near future. The creation of a new development bank has been one of the top priority issues that has been discussed so far in all BRICS summit in an attempt to bypass western-dominated International Monetary Fund (IMF) and the World Bank. News is that the leaders of the five Brics countries have signed a deal to create a new $100bn (£58.3bn) development bank and emergency reserve fund. The bank will have a headquarters in Shanghai, China and the first president for the bank will come from India. Brazil's President, Dilma Rousseff, announced the creation of the bank at a Brics summit meeting in Fortaleza, Brazil on Tuesday. She said that BRICS countries will have the power to introduce positive changes - ones that they think are more equal and fair. At first, the bank will start off with $50bn in initial capital – a "Contingency Reserve Arrangement" - will also have $100bn, and will help developing nations avoid "short-term liquidity pressures, promote further Brics cooperation, strengthen the global financial safety net and complement existing international arrangements". The creation of the Brics bank will almost surely create competition for both the World Bank and other similar regional funds. Brics nations have criticised the World Bank and the International Monetary Fund for not giving developing nations enough voting rights. The BRICS were prompted to seek coordinated action following an exodus of capital from emerging markets last year, triggered by the scaling back of U.S. monetary stimulus. The new bank reflects the growing influence of the BRICS, which account for almost half the world's population and about one-fifth of global economic output. The bank will begin with a subscribed capital of $50 billion divided equally between its five founders, with an initial total of $10 billion in cash put in over seven years and $40 billion in guarantees. It is scheduled to start lending in 2016 and be open to membership by other countries, but the capital share of the BRICS cannot drop below 55 percent. China, holder of the world's largest foreign exchange reserves, will contribute the bulk of the contingency currency pool, or $41 billion. Brazil, India and Russia will chip in $18 billion each and South Africa $5 billion. Reports quoting Reuters state that the deal was pulled off towards the closure. Negotiations to create the bank dragged on for more than two years as Brazil and India fought China's attempts to get a bigger share in the lender than the others. In the end, Brazil and India prevailed in keeping equal equity at its launch, but fears linger that China, the world's No. 2 economy, could try to assert greater influence over the bank to expand its political clout abroad. China, however, will not preside over the bank for two decades. Facing efforts by leading Western nations to isolate Russia for annexing Crimea and stirring revolt in eastern Ukraine, the BRICS summit provided President Vladimir Putin with a welcome geopolitical platform to show he has friends elsewhere, economic powers seen as shaping the future of the world.